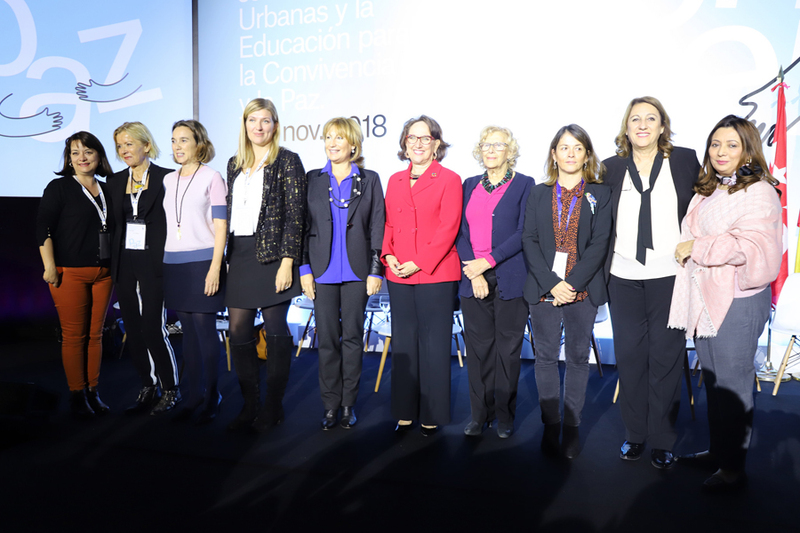 The UCLG World Council took place from 5 to 8 November in Madrid, back-to-back with the second edition of the World Forum on Urban Violence and Education for Coexistence and Peace, at the kind invitation of Mayor Manuela Carmena. The Madrid World Forum on Urban Violence is a meeting place for local leaders, international organisations and networks, the academic world, NGOs and civil society. Its purpose is to open a joint process of debate, reflection and construction of common solutions that foster urban environments capable of eliminating all expressions of violence. The debates in Madrid created a unique opportunity to highlight successful efforts by UCLG membership to achieve the global agendas and consolidate the message of peace and coexistence at the international level. The UCLG World Council kicked off on Sunday 4 November with a meeting of the UCLG Secretaries General to revise the work programme of the network as a whole and identify priorities and synergies for action towards 2019. Monday 5th November - first day of the World Council - was marked by preparatory working sessions. A meeting of the Committee on Local Social Economic Development was held to define the main activities of the Committee for 2019. The Community of Practice on Local Finance met for the first time and under the presidency of Parks Tau, President of UCLG to define the action plan for its contribution to UCLG’s strategy on localizing financing. For his part, David Jackson, Director of Local Development Finance, UNCDF put the focus on the Municipal Investment Fund to contribute to the financing of innovative municipal investment projects. Emilia Saiz, Secretary General of UCLG and Jean-François Habeau, Executive Director of FMDV concluded the session and set up the next steps of the Community of Practice. The day followed with a meeting to advance on the All-UCLG Gender Strategy and the Work Plan of the Standing Committee on Gender Equality towards the 2019 Congress. In parallel, a Metropolis meeting was held to discuss the priorities of the metropolitan section. Meetings of the Financial Management Committee and the Committee on Statutory Affairs also took place during the same day. The day concluded with the Opening Ceremony of the second edition of the World Forum on Urban Violence and Coexistence. Mayor of Madrid, Manuela Carmena hosted the Forum in which Parks Tau, President of UCLG and members of the UCLG Presidency Ada Colau, Mayor of Barcelona and Carlos Martínez, Mayor of Soria representing the Spanish Federation of Municipalities and Provinces (FEMP) intervened in the meeting addressing the challenges that local and regional governments face in building peace and coexistence. Tomorrow, the second day of the UCLG World Council, will be dedicated to the business sessions of the UCLG governing bodies and a political debate. Stay tuned and follow #UCLGmeets for more! Parks Tau, President of UCLG chaired the Business Session of the UCLG Executive Bureau along with Co-Presidents, Mauricio Rodas, Mayor of Quito, Ada Colau, Mayor of Barcelona and Roland Ries, Mayor of Strasbourg as well as Carlos Martínez, Mayor of Soria Vice-President for Europe and Berry Vrbanovic, Mayor of Kitchener and UCLG Treasurer. "Urban development must aim at the full development of each of its inhabitants." With these words, the Mayor of Madrid, Manuela Carmena, opendthe Executive Bureau, calling on UCLG members to fight side by side against the violence that strikes them. Members of the Executive Bureau discussed the Intermediary Cities’ Agenda as well as the local dimension of the Global Compact on Migration. Members highlighted the need for developing a Peace Agenda based on local diplomacy and analysed the UCLG Strategy on Localizing Municipal Finance for sustainable urbanization. The UCLG Executive Bureau encouraged members to join the Cities for Housing Declaration and defined the next steps for the call to action. Localizing the Sendai Framework and the climate agenda were also topics discussed during the session. To conclude, the UCLG Regional sections shared their highlights of the year and presented their priorities for 2019. Following the institutional session, a policy debate on the state of decentralization and local democracy worldwide was held. Panelists taking part in the debate were, Emilia Saiz, Secretary General of UCLG moderating the session, Clare Short, Chair of the Board of Cities Alliance, Sibel Uyar, Mayor of Urla, Rocío Molina, Councillor of Cochabamba, Tri Rishmani, Mayor of Surabaya and President of UCLG ASPAC, and Alison Evison, President of COSLA Scottish association. The debate aimed to support the development of the priorities of the World Organization towards the 2019 World Congress and to showcase the challenge of local governments to meet the demands of the communities. The second day concluded with the Business Session of the UCLG World Council chaired by Roland Ries, Mayor of Strasbourg and Co-President of UCLG and UCLG Treasurer Berry Vrbanovic. Members of the World Council analysed the 2019 Work Plan and the advocacy strategy towards 2019. The main findings and next steps for the Global Report on Local Democracy and Decentralization (GOLD V Report) and the UCLG Learning Agenda were also adopted by the World Council. Adrien Pieters from eThekwini-Durban, city host of the UCLG World Congress 2019, presented its views on this key event and Parks Tau, President of UCLG encouraged members of the World Council to participate in this triennial gathering. To conclude, the World Council appointed Uğur İbrahim Altay, Mayor of Konya as Co-President of UCLG. More #UCLGmeets tomorrow with a full day of political debates! Follow us on social media! The third day of the UCLG World Council and World Forum on Urban Violence saw the political debates on Peace, ecological transition, Right to the City, and the localization of the SDGs and where hosted by the UCLG Policy Councils. The Ibero-American Conference took place in parallel to these meetings. The Policy Council on Resilience hosted the political debate Local Governments leading the ecological transition which is largely related to resilience policies. The debate was chaired by Co-President Roland Ries, Mayor of Strasbourg and Fatimetou Mint Abdel Malick, President of the Regional Council of Nouakchott, along with Bev Esslinger, Councillor of Edmonton, Inés Sabanés, Councillor for the Environment and Mobility of the City of Madrid and Corinne Lepage, Former French Minister for the Environment, as panelists. The session focused on opportunities and responses to emerging crises in urban areas for inclusive, safe, resilient and sustainable territories. The political debate on City Diplomacy: key to peace was hosted by the Policy Council on Opportunities for All and the discussions focused on the promotion of peace at the local level. Jan Van Zanen, Mayor of Utrecht and President of the Association of Netherlands Municipalities (VNG), and Juan Mari Aburto, Mayor of Bilbao co-chairs of the Policy Council chaired the discussions and Mahmut Sami Sahin, Deputy Mayor of Konya and Vicente Lopanzi, Legal Adviser to the City of Mexico were part of the panel. In parallel, the first meeting of the UCLG Community on Practice on Housing was held where participants discussed a roadmap to transform the content of the Declaration of Cities for Housing into joint action to advance the Right to the City at local, national and international levels. Later on, Carola Gunnarsson, Mayor of Sala chaired the debate hosted by the Policy Council on the Right to the City. Speakers among which were Marta Higueras, First Deputy Mayor of Madrid, Jill Helke Director of International Cooperation of the International Organisation for Migration (OIM), Omar Heijra, Mayor of Oujda, Nkosengle Madlada, Councillor of eThekwini-Durban Municipality and Mohamed Saadie, President of the Union of Dannieh Municipalities and Co-President of UCLG-MEWA addressed the challenges and opportunities on migration and raised awareness of the key role of local and regional governments in migration management. The day concluded with the discussions of the debate hosted by the Policy Council on Territorial Multi-level Governance which focused on the Territorial dimension of localizing the Sustainable Development Goals (SDGs). The debate was chaired by Mónica Fein, Mayor of Rosario, Vice-President of UCLG for Latin America. Gustavo Baroja, President of the Association of Autonomous Provincial Governments of Ecuador (CONGOPE), Hassan Fateh, Gouvernor, Director of Heritage and General Direction of Local Governments of Morocco, Hassan Hmani, Deputy Mayor of Nanterre, Chair of the UCLG Forum on Peripherial Cities, Ahmad Kamareddine, Mayor of Tripoli, President of the Fayhaa Urban Area and member of the Committee of Mayors of Lebanon, Patrick Keuleers, Director of Governance and Peacebuilding, United Nations Development Programme and Mohamed Sefiani, Mayor of Chefchaouen, Chair of the UCLG Forum on Intermediary Cities took part in the debate. Back-to-back to these meetings, the 11th Ibero-American Forum analysed in depth the important and necessary role of local governments in promoting the improvement of citizens' living conditions, the Right to the City and those initiatives aimed at making cities scenarios of peace, equality and inclusion. The second edition of the World Forum on Urban Violence and Education for Coexistence and Peace concluded on Thursday 8 November with an all female panel. Female leaders from around the world met with representatives of civil society and academia to address urban violence in all its forms. The sessions organized within the framework of the Forum saw the participation of numerous UCLG members who shared the experiences and realities of their cities, defending Mayor Carmena’s view that local governments can teach how to resolve conflict and violence.